The unique, minimally invasive Uveneer direct composite template system creates beautiful direct composite veneers with predictable shape and symmetry. It mimics natural dentition and is designed to create high-quality, natural-looking anterior restorations in one visit. Uveneer templates use innovative technologies that help achieve a refined, anatomically correct, high-gloss restoration in a fraction of the time than if done freehand. Results are both reproducible and predictable. *Note: If you would like to order individual replacement templates, please call our customer service department at 1.888.230.1420. For international orders, please contact your Ultradent dealer or distributor. Q: When is Uveneer used? for direct chairside mock-ups before conducting the procedure to show the patient how the results can look. for communication with lab technicians and orthodontists. Dentist and inventor Dr. Sigal Jacobson is an internationally acclaimed lecturer with more than 22 years’ experience in aesthetic dentistry. She was named one of the top 25 women in dentistry in the USA for 2017 by the prestigious Dental Product Report magazine. She enjoys the pursuit of teaching and advancing skills in conservative aesthetic dentistry. She strongly believes that dentists need to protect the vitality of the tooth and respect the natural tooth structure.Dr. Jacobson is the inventor of the patented UVENEER™, a unique template system for creating direct composite veneers and mock-ups. 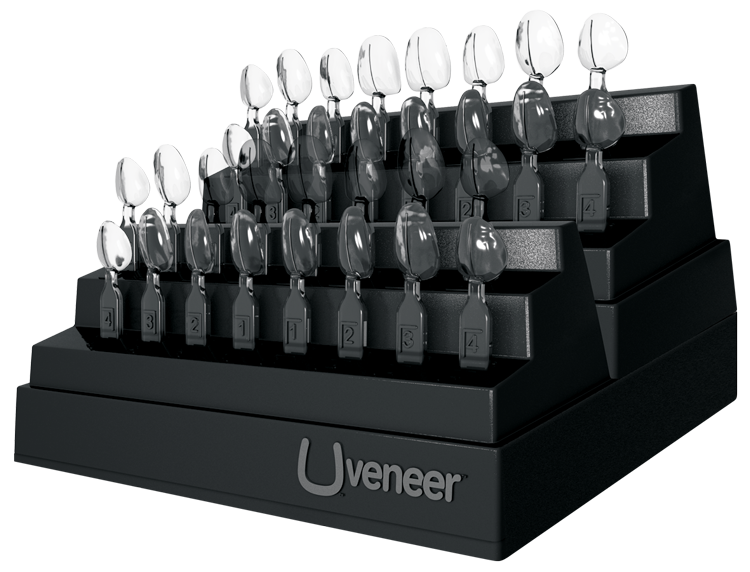 Uveneer was launched in February 2014 in Australia, USA and globally thereafter and is now used by thousands of satisfied dental clinics around the world. Dr. Jacobson has contributed clinical case studies in leading dental magazines in the USA and lectures on minimally invasive aesthetic dentistry and simplifying anterior composite restorations using the Uveneer system. In her lectures, she provides insightful tips and practical learning tools for everyday practice. A translucent template is pressed over the composite that has been laid on the tooth. The template is removed after the material has cured. It’s easy to handle, has a non-stick surface, is autoclavable, and hence reusable. It is now possible for any dentist to consistently and cost-effectively produce composite veneers that are predictable in final tooth shape and smile design. Uveneer™ creates composite veneers that are contoured and shiny like natural teeth, while saving time and effort—no more carving and polishing! Work smarter and faster with predictable results. Unlike prefabricated veneer systems, with Uveneer™ dentists use their own composite and can also use layering techniques. The Uveneer™ process removes several shortcomings of prefabricated systems including thickness, sizing and shade restrictions, cost, and stock holding. It’s so easy, dentists can incorporate more direct composite veneer work into their schedule, creating a real opportunity to increase practice income. Now dentists can give patients the option of composite veneers without the hesitation. 32 templates: 16 medium templates and 16 large templates. Both medium and large templates provide two central incisor, two lateral incisor, two canine and two premolar templates for both the upper and lower arches. Work smarter and faster with predictable results! Use Uveneer™.